Thanks for all of the positive feedback last week about the Brooklyn Autism Center’s fundraising case study. I heard from so many people who forwarded it along to their friends at non-profit organizations. 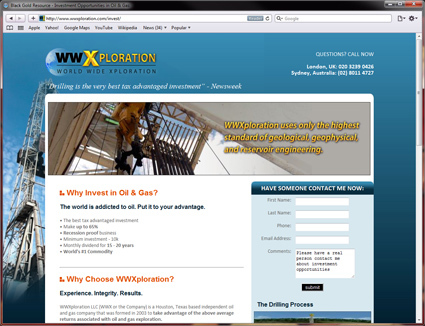 This week, with oil in the news, I want to focus on a different client — one that is looking to generate leads for investment in oil exploration. Sound like a tough sell? It’s counter-intuitive, but we’ve started to generate great results! Right now, with the BP Oil Spill disaster in the Gulf of Mexico, there’s intense interest in alternative energy, and preventing future disasters from happening. Like it or not, the world is addicted to fossil fuels. Here in Boulder, Colorado, about half of our office rides their bikes or walks to work each day. But I know it’s not realistic to ask everyone to give up their cars – the US economy and infrastructure is largely based on the car as personal transportation. At Customer Paradigm, we take environmental issues seriously, and have done a lot of work for Greenpeace and solar energy manufacturers, too. We’ve built sustainable development software planning tools for the Global Environmental Management Initiative (GEMI.org). 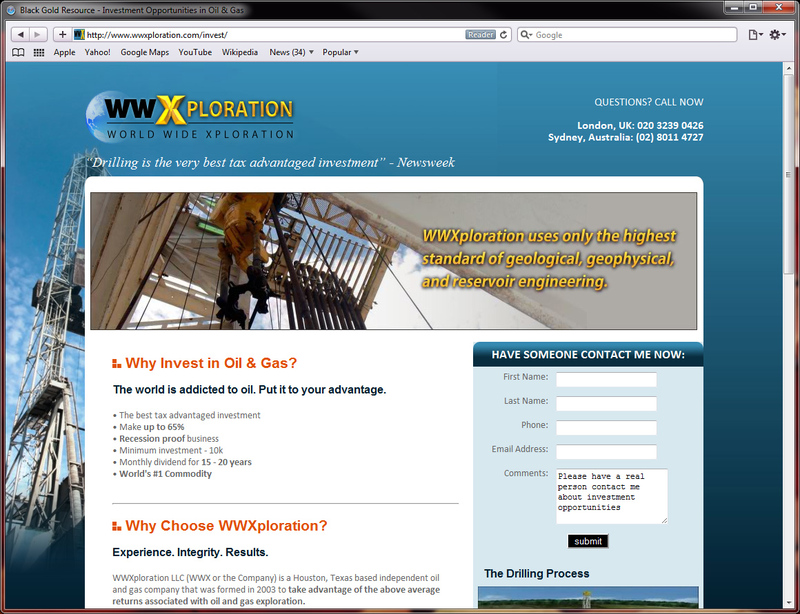 We’ve also worked with BP, Shell and other energy companies to help them with marketing campaigns. But an interesting trend has also emerged. With the oil spill in the news, pricing for direct investment in oil exploration has fallen to low, low levels. The Goal: Our client, Andy Leib, is an independent broker who helps bring investors and companies together. He wanted us to use search engine marketing to drive leads from Australia and UK. 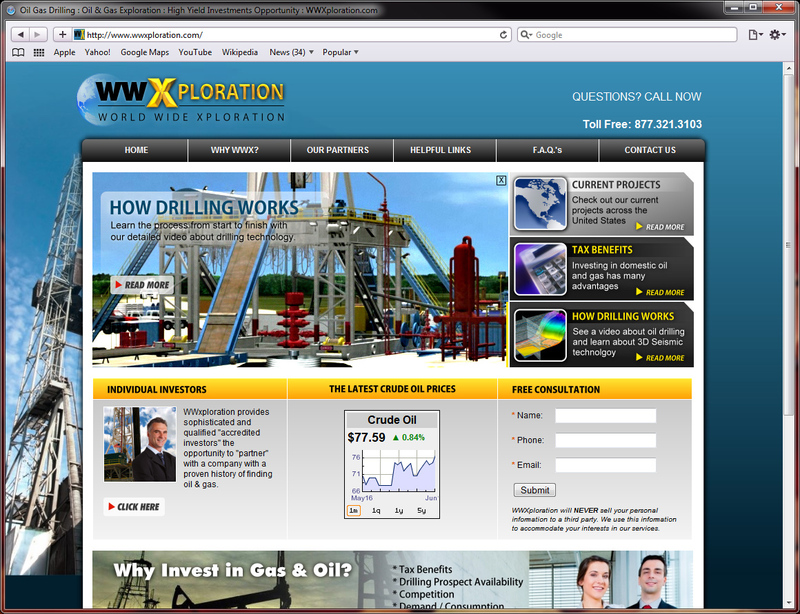 We’re also helping the company, wwXploration, drive US and Canadian leads, too. Our Pitch / Idea: Jesse Schultz and I listened closely to Andy. We tried to understand what motivated the end user to want to invest directly in oil exploration (high returns, and tax benefits if it didn’t work). The Strategy:Drive leads via geo-targeted Cost Per Click (CPC) advertisements on Google, Bing, Yahoo and Facebook. Traffic would be sent to a dedicated landing page on the wwXploration.com website, and code would be placed on the site to make sure that if a lead came in from overseas, special trackable phone numbers and contact forms would be displayed. Our goal was to create a compelling, trusted experience for site visitors. The second day the campaign ran, the client received four phone calls and three contact form submissions — way ahead of expectations. They’re thrilled with the initial results so far. 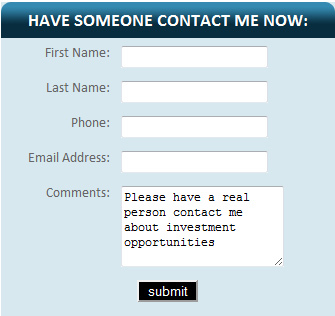 Client Feedback: “The phone just keeps ringing with great leads! I’m really happy.” In summary a well designed landing page, with strong calls to action, combined with Pay Per Click Marketing generated strong leads within two days of activating the campaigns. I hope you found this case study helpful – let us know if we can help with PPC advertising campaigns for your organization. To have Customer Paradigm contact you about PPC Advertising Campaigns please fill out the contact form below or call us toll free at 888.772.0777 or 303.473.4400.